Beauty is feeling the warmth of the sun on your face every day; it is being able to breathe and give and receive love to everyone and everything! 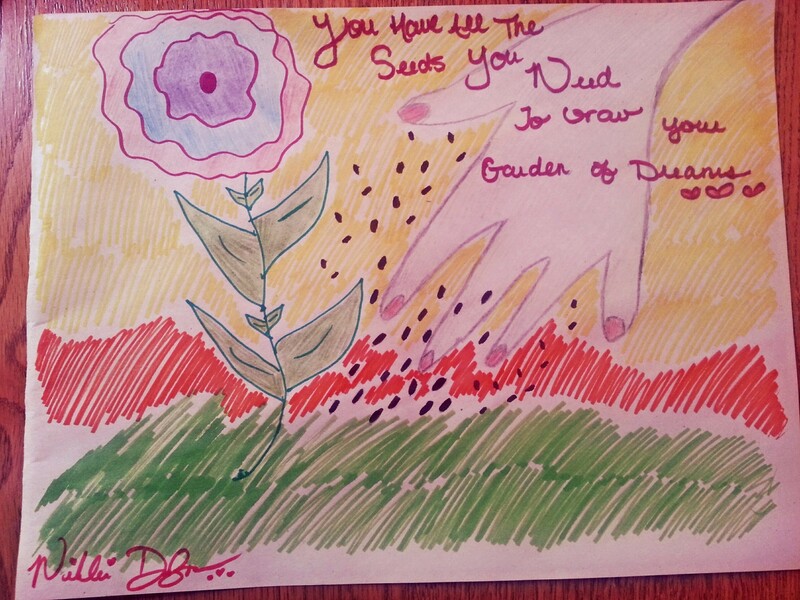 You have all the seeds you need to grow your garden of dreams.♥ I believe in YOU!! What are your dreams and how are you taking steps today to reach them? Go to Facebook, tell me your dreams, how you’re making them grow and use the #BeautyProject! Time to kick of the B.E.A.U.T.Y project for 2014! I would love to know what BEAUTY means to you! For me, Beauty means “Being Eternal Always Unique Truly Yourself.” I believe that being myself makes me beautiful, and discovering myself, learning through my mistakes and not punishing myself for them helps my light to shine through brighter! Without the guidance and support of Linda F., my sponsor and mentor for the past couple of years, I do not know where I would be in my recovery. She has been monumental in helping me along the twelve-step program and has been a positive female role model in my life. We all need role models and I appreciate all that Linda has instilled in me throughout the past couple of years. Because of her care and guidance, I have had the courage to pursue my dream of going back to school and help others recover from eating disorders. I can honestly say that all things are possible with God and when you take steps in Faith every day to pursue your dreams, there is nothing in life that you cannot accomplish. Thank you Linda for all you have done for me; I love you so much! To get help NOW privately and confidentially for an eating disorder, or to get screened free of charge, please visit the National Eating Disorders Association. NEDAwareness Week is proving to be an enormous success already this year, and my B.E.A.U.T.Y project is also! Your submittals about what Beauty is to you are coming in and they are true, inspiring and refreshing. I would like to share a poem that was written by a lady by the name of Joan P., an eating disorder survivor. This poem serves as her interpretation of B.E.A.U.T.Y. To get help NOW privatley and confidentially for an eating disorder, or to get screened, please visit the National Eating Disorders Association. 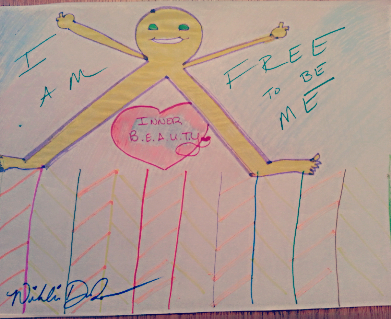 NEDAwareness Week Day Two: B.E.A.U.T.Y by Olivier B. 1. Beauty is the smile of nature. 3. Beauty is diversity completing itself in a compelling and powerful way. 1. Beauty is a good reason to exist. 2. Being in the pursuit of beauty will never be a lost cause. 3. Virtue is beauty of the soul, genius is beauty of the mind, love is beauty of the heart. 4. For everyone beauty is an inspiration, but for some beauty is an aspiration. 1. Virtue is the natural scent of beauty, vanity is its artificial perfume. 2. Inspiration is the zeal to go for the unknown. 3. Beauty consumed instantly is perennial, beauty found little by little is eternal. 5. Beauty is diversity completing itself in a compelling and powerful way. 6. Beauty is the art of hope and surprise. To get help now for an eating disorder, privately and confidentially, please visit the National Eating Disorders Association. Posted in B.E.A.U.T.YTagged God Christian I can DO all things through Christ Who Strengthens me But Without Him I can Do Nothing God Loves you Nikki DuBose thenikkidubose.com Olivier Bassil musician Infectious SuperPowers singerLeave a Comment on NEDAwareness Week Day Two: B.E.A.U.T.Y by Olivier B.
NEDAwareness Week Day 2: The B.E.A.U.T.Y Project by Linda F.
For #NEDAwareness Week let’s get started with the very inspiring submittals that have been coming in from all over. I am Blessed to share these with you as part of #thebeautyproject. 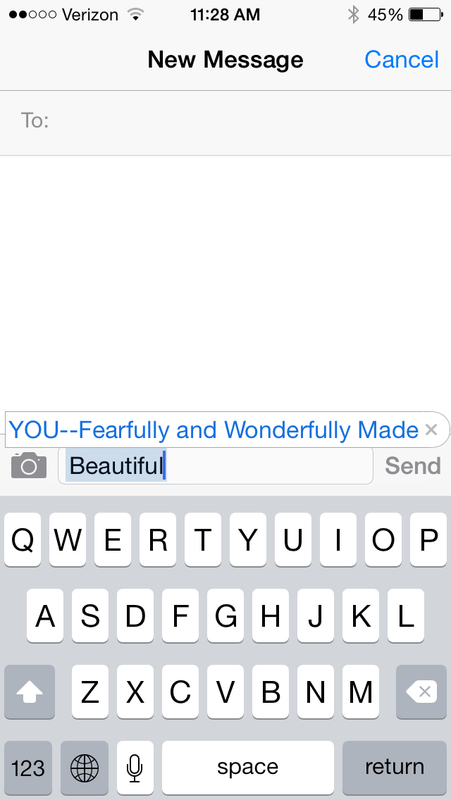 What is B.E.A.U.T.Y to you? To get help now for an eating disorder, or for a confidential screening, please visit the National Eating Disorders Association. To contribute to #thebeautyproject, email me: nikki@nikkidubose.com. Posted in B.E.A.U.T.YTagged God Christian model I can DO all things through Christ Who Strengthens me But Without Him I can Do Nothing God Loves you NEDA NEDAwarenessWeek inner beauty outer strength bulimia anorexia B.E.A.U.T.Y.Leave a Comment on NEDAwareness Week Day 2: The B.E.A.U.T.Y Project by Linda F.
To kickstart this critical week off, I would like to dedicate it to my mother, Sandy Cargile, who passed away last year. She battled bulimia quietly for many years when I was a child. Sadly, she exchanged one addiction for another and was a heavy alcoholic. She died in an alcohol-related car accident in August of 2012. I think it’s important to understand that not taking care of addictive behaviors and going into recovery as early as possible can be like writing your own suicide note. Do you really want to be a sad story on yesterday’s news, or do you want to be out there, victorious, an overcomer, and helping other people live a life of destiny too? So for me beauty is saying NO to the things, people, places and habits that do not make me a better person, a recovered person every day. Every day I go out and live like the Queen that I know God made me to be, living my life to the fullest, helping others and inspired; I know I am beautiful, living my beautiful life. Mom, my healthy life and helping others every day is dedicated to God and to you. I love and miss you so much. I know that this is what you would want. Rebecca Kister: Young, Beautiful, A Voice For the Bullied. Sure she’s young, beautiful, and at first glance, wouldn’t seem to have world of troubles with her perfectly groomed hair, translucent skin, and gorgeous white teeth. How in the world could she be a representative for all of the hundreds of millions of bullied young people everywhere in the world today? Give up? You see, just like all of us really, Rebecca is a voice for the bullied. At one time or another not only was I bullied in school for my thick glasses, small voice and slight scoliosis, but I myself became the bully and gossiper so many times. There is no point in hurting others, especially at young and critical ages in development. I say let’s all join forces with Rebecca and help to put a stop to bullying, hate and negativity, one kind gesture at a time. Here is Rebecca’s exclusive interview below on her viewpoint of bullying, beauty, and her upcoming spot on “Our Voice”, a TV show dedicated entirely to giving young people a platform on a wide range of important topics. What is a “hero” to you? How do you currently view our bullying situations in schools? Many professionals say that most issues at school start in the homes. In your opinion is this true for bullying? Do you think that bullying is “kept quiet” like a lot of other issues going on with young people? Do you think it is past the time we as a society should be speaking out against bullying? What should someone do if they are being bullied? Stop Bullying All-informative website for adults, teachers and youth on bullying in person and online. Bully Stoppers First website created where students can anonymously go and report bullying that can be viewed by the appropriate officials at schools to take action. Bully Online All-inclusive website that offers links to various sites on bullying articles, resources, help and information for parents, officials and youth alike. Kids Health Offers help for kids dealing with bullies on a wide range of topics from emotional health, warning signs to information for parents. I heard you are on a TV show, how exciting, can you tell us about that? “Yes! I’m a Segment Host and Cast member on a Television show Called “Our Voice” and i’m so excited to be apart of not only this show but the movement behind it as well. We are a group of Young adults who are making a difference and making our voices heard. Our Voice was created to give a voice to our youth and young adults. Often times, our opinions are disregarded simply because of age; however, this bias can be the one thing standing in the way of true progress in our world. This television show was created to be raw, uncut and uncensored so that we young adults can feel free to share how we truly feel about the issues facing us today. This is where the youth will come to speak their minds and be heard. This is where the change begins! Not only are we speaking our minds but (the show is highly interactive as well because) our audience will be able to Tweet or Facebook us questions they want answered and we will be able to disscus it on the show. To be apart of this TV Show means everything to me because it’s my gateway to actually make a difference in the world. As of September we start filming and it should be Airing sometime Early October but you can stay updated with me and “Our Voice” by liking my Fan Page and “Our Voice’s” Fan Page. Why do you think as a culture, we judge people based on their looks? What do you just want to scream to the world, in other words, what is your primary message about looks? “I believe we judge each other because we go home and see pictures of these so called “Perfect” girls when in reality that’s not even what they really look like because they are photo shopped so much they don’t appear as they do in real life. My message for girls out there: don’t try to be something you aren’t because you are absolutely beautiful just the way you are, God created you just the way he wants you. People may be different but it’s because (God) wants you to be unique and special. God makes no mistakes. I just hope you love yourself just the way you are because everyone is beautiful. Beauty doesn’t just come from the outside it comes from the inside. Just Be YOU!!!! Posted in B.E.A.U.T.Y, Point of YouthLeave a Comment on Rebecca Kister: Young, Beautiful, A Voice For the Bullied. My heart goes out to the incredible forgiveness shown in this story by a man of the name of Luis Gonzalez. I understand how forgiveness heals and how hard it can be, and you only hold yourself prisoner when you hold resentment in your heart. Thank you, Luis Gonzalez, for sharing your story, and may your sweet son rest in Peace. I also want to thank Union Rescue Mission, and Christopher Kai, for their outreach and support. 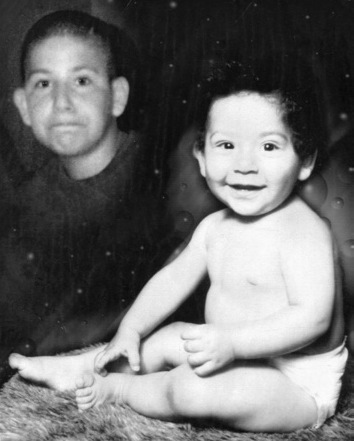 “The first time I saw Little Luis, my youngest son, I was in county jail. His mother brought him to see me. I saw him through the glass. He was four or six months old, something like that. After that, I didn’t see him for more than 10 years because I was into gangs and addicted to drugs. I’m not proud of that. I’ve also been locked up in a lot of prisons: Chino, Tehachapi, California Men’s Colony, and Pelican Bay. Pelican Bay is a super-maximum security prison; they call it ‘The Bathroom’ because that’s where they put human waste. I said, ‘No, I’m dirty.’ I was still using drugs. Since that meant I had violated my parole, she gave me an option: either go to a program to clean up or go back to prison. For me, it was an easy choice. I chose going to a rehabilitation program at Union Rescue Mission in downtown Los Angeles. When I first got to the Mission, I was in real bad shape. They would drug test me three times a day. At one point, while I was trying not to use drugs, I fainted and had to go to the hospital. But after about a month, I started getting better and began working. I mostly took care of housekeeping duties like cleaning and vacuuming, sweeping the outside courtyards, and taking out the daily trash. I kept asking her to see my son, so she finally said, ‘Let me talk to him first. Call back tomorrow.’ The next day I called back, and my ex-wife picked up the phone. I could hear my son, Little Luis, crying next to her because he wanted to see me. On a warm afternoon in late March, I arranged to go see him. I called his mother on a payphone close to their house and she said that Little Luis was at the local park. When I got to the park and walked around, I didn’t see nobody. I called my ex-wife again and told her he wasn’t there. At that moment, I saw a little kid riding by me on his BMX bike. He was wearing khaki shorts and a white t-shirt. I’ll never forget that. I thought to myself, Wow, that’s my son. He rode away, and then, while I was still on the phone, I could actually hear him walking into the house as I was talking to his mother. He told his mom that he just saw his dad and my ex-wife said he was crazy. But when he described me as ‘a big guy with a big mustache,’ she knew he was right. So, Little Luis ran back to the park, and when I hung up the phone, we gave each other a big hug and walked back to the house. Sometimes, we would take two plates of food from the Mission, walk over to the park, and have a soda and a nice meal. It was fun. It was great. We didn’t need to spend any money to be happy. Everything was going great, but then one day, I took him back to his mother’s place and no one was home. So, since I didn’t want my son to stay home alone, I broke into the house and stayed the night. At that point, I made up my mind: I wasn’t going to let my son be by himself like this. I was going to get custody of my son. So, Chaplain Tino helped me, and we spent a few months going back and forth to court. The court wasn’t sure if I could provide for my son on minimum wage, so Mr. Ken McGill, the super- intendent of the Mission at the time, wrote a letter saying that the Mission was willing to supply me with all the furniture and food I needed for however long I needed it. Finally, when Chaplain Tino and I found a one-bedroom apartment in South Central, the judge gave me custody of Little Luis. Every morning, we would leave at 7 a.m. I would give Little Luis a kiss and a hug and he would walk the four or five blocks to school and I would catch the bus across the street and go to work. Every night, we would eat a light dinner and play basketball at the park with another father and son, and then come back and have real dinner. After dinner, we just talked, watched TV, and then that was another day. On Sundays we attended church together. The pastor would always ask Little Luis, ‘Hey Luis, how many hits did you get? Did you score any homeruns?’ Little Luis used to brag about baseball ‘cause he was really good. But, then everything changed in an instant. It was like any normal day. The phone rang at work. One of my co-workers said there was a police officer on the phone for me. When I answered, he said, ‘Are you Mr. Luis Gonzales? Do you have a son named Luis Gonzales?’ I told him I was. He said, ‘Well, your son’s been shot. Please come to the hospital to see him.’ When I heard this, I told him, ‘No, you got it wrong. I just spoke to my son.’ I had called Little Luis just a few minutes before to check on whether he had started cooking dinner or not. When I first heard my son was shot, I didn’t think it would be serious. I thought, maybe he got shot in the hand, or something like that. When I got to the hospital, they made me wait for a long, long time. When I finally walked into the room, and I saw my son lying in bed, I went into shock. It was just me and a nurse who was holding my hand. His mouth was covered with an oxygen mask. His forehead and the left side of his face were bandaged and there were IV lines all over. His skin tone was purple and there was dry blood all over his face. The machine was keeping him alive but he was already brain dead. They kept him alive because they wanted to see if I would donate his organs, but I said, no, I wouldn’t. When I left, he was still breathing but he was in real bad shape. They eventually removed the machine that kept my son alive. He died on Monday, April 28, 1999. Little Luis was 14 years old. In time, I learned from the police report that the shooter had to ‘prove himself’ by doing something ‘big’ for the gang he was with, so he invited my son and another kid to his house. The guy waited in a dresser for them and when my son and his friend arrived, the shooter opened the dresser and shot my son in the face. The other kid shouted, ‘What are you doing?’ And the shooter replied, ‘You’re next.’ That’s when the other kid ran out and escaped. The kid who shot my son was only 16 years old. A few months after my son was shot, I walked into the courtroom for the trial of my son’s killer and saw this old black guy sitting at the bench. He was the same judge that gave me custody of my son. It was the same judge, in the same juvenile courthouse, in the same room in South Central, Los Angeles. I don’t recall much about the court proceedings— they went on for a few months—but I will never forget the sentencing. After that, the judge said some closing remarks. I didn’t even bother to hear the sentencing because it didn’t matter. If he was in prison for a day or his whole life, I didn’t want nothing to do with it. As I was walking out, I saw people crying. I didn’t cry. I didn’t make a big scene. I just walked out of that courtroom and said to myself, it’s over. I had to move on. I had to forgive and let go of the anger. Anger is like poison; it would destroy me and everyone around me. I had to forgive and let go of the anger. Anger is like poison; it would destroy me and everyone around me. For me, those things in my past were over. I had accepted Jesus Christ, so I had to forgive. God does everything—He brought me to the Mission, where I was able to clean up, get a job, and an apartment, all the things I needed to raise my son. He also brought people like Ms. Lori Sims and Chaplain Tino into my life to help me along the way. We just need to make the right decisions. Keep dreaming, work very very hard, and never give up. “My bedroom was lit in a soft red glow. I had draped a red men’s dress shirt over the dresser lamp so my room wouldn’t be so bright. I didn’t like bright lights. I was sitting at my vanity set in my bedroom at 3 a.m. and my family was fast asleep. It was deafeningly quiet. We lived in a house that was at the end of a cul-de-sac in a suburb of Boulder, Colorado. On my desk was a box cutter. I stared at it for five minutes. Should I or shouldn’ t I?, I thought. Right before I pressed the metal blade into my skin, I breathed deeply. Slash, slash, slash, slash. We lived in Florence, Italy when I was a child. One evening when I was about two, my father took me to a local park. I was wearing my bright yellow floral-print dress, short white lace socks, and formal shoes. He stopped suddenly as we reached a shallow part of a pond and told me to walk by myself to the edge of the water. I skipped over to the pond and leaned forward, careful not to step in the water. ‘Cosa vedi nell aqua?’ he said. What do you see in the water? I replied that I saw yellow sand that looked blue, green plants that looked like hair, and tiny fish darting in the water. Then he said, ‘Guardami!’—look at me. When I turned to look at my father, there he was on one knee, holding his black Pentax camera, angled at me; I heard the clicking sound of his camera as I stood perfectly still, just like he had taught me over the months. My father had a passion for photography and I was his Little Miss Perfect model. In his photography, he could transform any ordinary portrait into a thing of beauty, just by changing the angle of the shot, the lens, the lighting, and the camera he used. Though I didn’t know it at the time, I think he believed that he could apply the same exacting approach of manipulation and control over his photos to manipulation and control over me. That was the extent of my conversations with my father. He always seemed busy with his own work, or like he preferred spending time with my younger brother, Antonio. He rarely talked to me—except to criticize my behavior or lecture me about my grades. When I was eight years old, my father abruptly disappeared from my life. In Italy, he was a respected businessman. In America, he felt lost. He couldn’t speak English well, so very few people understood, respected, or related to him. This deep cultural shock ledhim to a psychological breakdown. He was experiencing increasing paranoia, and felt that people might take his family away. My mother noticed his erratic behavior, and couldn’t trust him anymore. She told him she was going to leave him. When he heard this, he got extremely angry at her. When I was at school, my father drove off with my mom and my three youngest siblings, all under five. In the car, he threatened to crash the car and kill her if she didn’t promise not to leave him. She was eventually able to reach the authorities, and they arrested my father. Before he was set to go on trial, he fled the country. The judge, police department and social services all agreed that it would be safer for our family to stay in the States because they feared my father was going to harm us. His physical departure ripped open my life and our family. When he left, he took with him a dozen large boxes filled with hundreds of family photos. All my childhood memories—playing with porcelain dolls when I was a baby, visiting a castle in Italy when I was three, or playing with seashells at the beach when I was four—were all erased. It felt as if I had never existed, as if I was never his picture perfect model—as if I was never his daughter. Long after my father had left, I held onto his unrealistic expectations of me as a person. If I didn’t do well in school, I was a failure. When I returned home and my mother criticized me for not doing my chores, I felt shunned by my family. I was always alone. I felt like I was choking and had an unbearable pressure in my chest that lingered for days or weeks. I remember coming home on the school bus one day when I was 13. I was sitting next to my classmate, Erica. I saw that she had a few horizontal scars on her arm, so I asked her, ‘Do you have a cat?’ Erica replied, ‘No, it’s what I do when I get stressed.’ I didn’t understand. I kept asking her, ‘Why don’t you just read a book, or watch a movie?’ She said, ‘It just works better. It’s faster.’ I was still confused how cutting could relieve stress. But then, more than a year later, I needed a release. I tried it. The first time, I was in my bedroom. I casually scratched a small ‘M’ on top of my left wrist with a broken Christmas glass ornament. A thin line of blood, like from a paper cut, appeared. Over time, I focused on creating scars and that usually took months. I would re-cut myself in the same spot, 30 or 40 or 50 times, over and over again. I progressed to larger cuts: on my wrists, arms, neck or back. Eventually, the deeper the pain I felt, the deeper the cut I made. It didn’t matter what I used: broken pieces of glass, sharp razors, a box-cutter, a nail, scissors, a broken hair clip, and even a slim knife. Every time I cut, it felt as if my skin was lit on fire and I had poured alcohol on it. But somehow the silent action of cutting open my skin came with an immediate anesthetized feeling of numb calmness. About a year after I began mutilating myself, I abruptly stopped. I made a promise to my close friend: he promised not to kill himself, and I promised not to cut myself. I didn’t care about my well-being at the time, but I deeply cared about his. I eventually discovered a less destructive and healthier outlet for my emotions, one that I could use frequently without the side effects of long-lasting scars and their emotional consequences—meeting virtual friends and acquaintances on the internet. I found friends on online social networking sites like Mbzzy.com and Mobamingle.com. Both of my best virtual friends, ‘Sour Sanity’ and ‘Maya Landers,’ had gone through even more traumatic family issues. I felt like they understood what I was going through and I didn’t feel as alone. Mobamingle.com also allowed users to upload stories, so during the course of two years, I shared over a hundred poems with my virtual friends. Each story posting had a place for responses and ratings, and out of 73 total responses I received, I had a score of 4.8 out of 5.0. I had finally found a constructive, positive way of expressing my emotions. 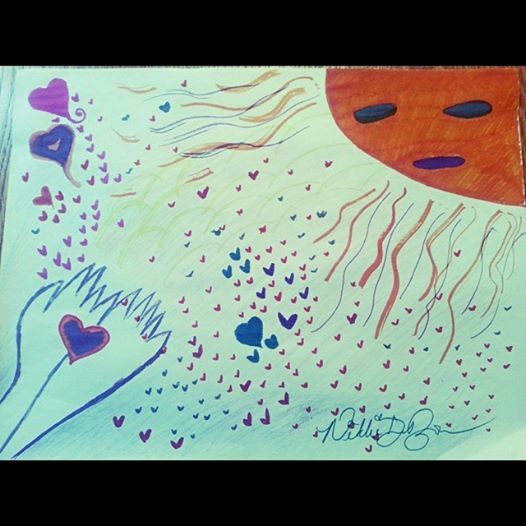 Not only did I write prose and poems, but I also created art and music as well. These four activities, which represented my heart, mind, body and soul in different ways, made me feel more grounded. But, then we moved again, this time to Los Angeles. Initially, we lived in part of a house my mother rented in Culver City. A few months later, one of the most drastic and devastating events of my life happened. My youngest sister, six-year-old Leonora, accidently drowned in an acquaintance’s pool. My mother was so distraught, broken, and emotionally wrecked by losing Leonora that she had a breakdown. She was unable to care for us, unable to care for herself. She moved to Union Rescue Mission in downtown Los Angeles. The Mission offered to house, care, and counsel her while she resolved work visa issues and got on her feet again. Until that point, we were living off my mother’s savings from her previous jobs as a housekeeper. My siblings and I were separated into different foster homes. My two younger brothers were sent to one foster home, and my younger sisters and I were sent to another. We lived about an hour drive away from each other in Palmdale, California, and I only got to see my brothers occasionally. In November 2010, after three months apart, we were joyfully reunited with our mother at Union Rescue Mission. Living in Skid Row has been a harsh reality check. The very first day we arrived at the entrance of Union Rescue Mission, I saw drunks, drug addicts, pimps and prostitutes on San Pedro Street. When I walked out of our car, I smelled a horrible mixture of dried urine, body odor, and cigarette smoke. After all the paperwork was processed, my family and I went from sharing a house in Culver City to sharing a single room on the fourth floor at the Mission. Sometimes other families live with us as well, so there can be up to ten people living in a 180-square-foot room. Despite the tight quarters, living at the Mission has actually helped my family grow closer and more protective of each other. We eat most of our meals together. After dinner, there’s nowhere else to go, so we sit in our room and just talk about how each of our days went. I am gaining a new awareness of and appreciation for my siblings. Thankfully, countless warm-hearted volunteers and staff members at the Mission are there to support me. Chris Mason, the youth coordinator, is always there for me. When he asks me, “How are you doing?” I feel like he sincerely wants to know. One day when I was feeling really down, he cheered me up by handing me an enormous chocolate chip cookie. When he found out that I played the piano, he arranged for me to gain access to the grand piano in the chapel downstairs. All these simple acts of kindness help me stay positive and grounded. I’m 17 years old now and after all that I have been through, I just want to stay focused on school. I am currently earning A’s and B’s at Roosevelt High School in Los Angeles and in the fall of 2012, I want to apply for a four-year university. My mother is working on getting a job so that, soon, we won’t be living in a homeless shelter. One day, when I graduate from college, I want to be like Oprah Winfrey. She experienced a horrible and hurtful childhood, yet grew up to be such a powerful business woman who reaches so many people. She transformed her pain into a way to heal others. She invites people into her life, and through her example, hopes to be a positive role model. Through my writing, painting, and music, I hope to do the same. Thank you in advance to my good friend Christopher Kai. Check out the organization he works with, Union Rescue Mission. Kenneth, your Heart and Spirit are that of a True Champion. I am deeply touched by this story and in many ways relate to you. I applaud you for always wanting to reach higher, may God continue to Bless you and Keep you. There is no limit to the heights you will climb and the people whose lives you will change. “I was 10 years old the first time I became homeless. It all started when my mother dropped out of middle school. She had her first child at age 14 with my father, a 23-year- old, child-molesting alcoholic. Four years later, I was brought into this dysfunctional family. When I was two, my father left me, my sister, and my pregnant mom. My mother raised us but she never worked for more than four months at a time. She relied on monthly welfare checks and food stamps to take care of us. Aside from cereal, all we ate were Nissin Cup Noodles—for our lunch, snack, and dinner. I hated eating those noodles. My mother eventually met and married a new man. He would frequently beat me and my sisters. To this day, I get flashbacks of that worn-out, black leather belt. Over the course of eight years, we were whipped hundreds of times. Social workers paid us visits. They would always ask the same questions and we always told them the same answers. If they asked, ‘Do you guys feel comfortable living in this home?’, we would respond, ‘Yes.’ Then they’d ask, ‘How do your parents discipline you?’ and we’d say, ‘They hit us across the butts with their hands or they put us in the corner.’ Their favorite question was, ‘If you had a choice, would you leave home?’ And we’d respond, ‘No, we like it here.’ My mother never did anything. She was so addicted to prescription drugs that, at times, when I asked her what her name was, she would stutter for a few minutes and only then remember her name. By the time I reached fifth grade, my parents’ irresponsibility finally caught up with us, and we were left homeless. When I was 11, my family and I slept in a brown 1988 Ford Econoline for over a year. Being homeless meant that towards the end of every month, when my mother’s food stamps ran out, I was always hungry. For most of the year, outside of school, all we ate were cereal and noodles and cold bologna sandwiches. On good days, my mother brought us pizza and Chinese takeout. The best food day was when my mother bought an $8 buffet at Shakey’s Pizza Parlor, and stuffed as much pizza, Mojo potatoes, and fried chicken as she could fit into a plastic bag in her backpack. As soon as my mother unzipped her backpack, I attacked the bag. I ate like a wild animal, grabbing whatever I could in my hands and stuffing it in my mouth. It really didn’t matter what I ate, as long as it wasn’t cereal, noodles, or cold bologna sandwiches. Since we only did laundry once a month, my clothes were always wrinkled and stained. My classmates at school were so cruel. They made fun of my uniform when they saw the same ketchup stains on the same areas on my white collared shirt or navy blue pants. My sixth grade English teacher asked me if I used deodorant. ‘Yes,’ I replied, ‘but sometimes I don’t have any money to buy more.’ So, she actually bought deodorant for me. After that, every day, I would rub deodorant all over my clothes as if it were cologne, hopefully covering any unpleasant odors. Though the hunger and lack of cleanliness were extremely unpleasant, the worst part of being homeless was the frigid winter nights. There was no insulation in the van, so all of us would huddle under one blanket during those numerous, endless, excruciating nights. The darkest and most difficult nights were when it rained. One year, a few days after Thanksgiving, I remember walking back to the van with my head bowed, trying to avoid the rain on my face. My shoes and socks got drenched. That night, I kept my cold, wet socks on because I thought I’d be warmer than with them off. I despise cold weather with an unforgiving passion because of these bone-chilling memories. For the next five years, I never really had a home or even my own bed. After living in the van, we moved to my grandmother’s house and then to her friend’s house. After that, my sister Stephanie and I lived in a foster home where they separated the guys from the girls. There were about a dozen single beds in a large, unfurnished room. There were always people coming and going, so I always had to switch beds to accommodate new people. In only four months at the foster home, I moved beds close to 15 times. I also had to share the room with up to 11 other guys, some of whom were gang members. Because of this constant moving and instability, by the time I finished my sophomore year in high school, my grades weren’t the best. I had a 2.2 GPA. Facing this mountain of obstacles, I was never supposed to succeed—but I did. I eventually ended up at the Union Rescue Mission in downtown Los Angeles, and stayed for most of my junior year and part of my senior year of high school. It was not a fun place, but it was the only place I had to call home. Most importantly, it was the most stable place I had lived in five years. I had a room where I could study. I had meals to eat. And at night, I knew I would be sleeping in the same bed. These basic necessities, necessities that most people take for granted, created the solid foundation I needed to do well in school. After attending 12 schools over my 10 years of formal education, I finally achieved one of my greatest life goals. In the fall semester of my junior year at Helen Bernstein High School in Hollywood, I got straight As on my report card. I remember opening up my report card in front of the counselor and some friends. When I saw a vertical line of As, I started jumping up and down like a five-year- old kid, screaming and shouting as if I had just come off the tallest rollercoaster ride in the world. That same year, I was voted ‘Best Overall Academic Student.’ In my junior and senior year, I averaged a 3.8 GPA. Outside of academics, I played football, swam, and ran track. I was even voted Student Body President both my junior and senior years—in a school with about 2,000 students. Because of my unique experiences, my story was featured on CNN. As a result of that news story, I got to meet and befriend NFL player Nnamdi Asomugha, observe world- renowned neurosurgeon Dr. Sanjay Gupta perform surgery, and share the stage as a student speaker with Antonio Villaraigosa, the mayor of Los Angeles. I even received a congratulatory letter from former President Bill Clinton. When the CNN story came out, many people including my teachers, friends and classmates were shocked. They couldn’t believe how many tough challenges I faced and eventually overcame. People ask me how I got through so much at such a young age, but I just tell them that when you grow up not having much, you get used to it. Some people like to probe deeper, but I really didn’t think much about it. If your friends and family and everyone you know are poor, then being poor becomes normal and routine and having money is abnormal and unusual. And, during the toughest times, I did have my maternal grandmother, who would occasionally house and feed me when we were homeless. Even when she was laying in a hospital bed being prepped for hip surgery, she wrote me a check that paid for my first pair of football cleats. What I’ve learned from my experiences is that I can lose my home, my bed, and my clothing, but my education follows me everywhere I go. I have already been to the bottom; school was my way of getting to the top. Throughout all of my difficulties, school was and still is my paradise. My grandmother had seven kids and numerous grandchildren, but none of them ever graduated high school. She was 67 years old, and it was her first time ever attending a high school graduation. I can honestly say that I felt happier for her that day than for myself. Since the whole school knew my story, when they announced my name over the loudspeakers, the entire audience erupted in applause as I walked across the stage to receive my diploma. After I shook hands with school administrators, I turned to the crowd and started dancing. A few months later, I found out that I was accepted into Loyola Marymount University in Los Angeles. I will be the first and only person in my entire family to attend a four-year university. When I graduate college, I will continue working for a better life. I want a good job where I can afford a comfortable home and buy basic necessities without worrying about money. And, when I have kids, I never want to hear them ask me, ‘Can we eat today? Is there enough money to wash our clothes? Where are we sleeping tonight?’ No child or adult should ever have to ask those questions. In my kitchen, though I may eat cereal, I’ll pass on the cold bologna sandwiches and Nissin Cup Noodles.